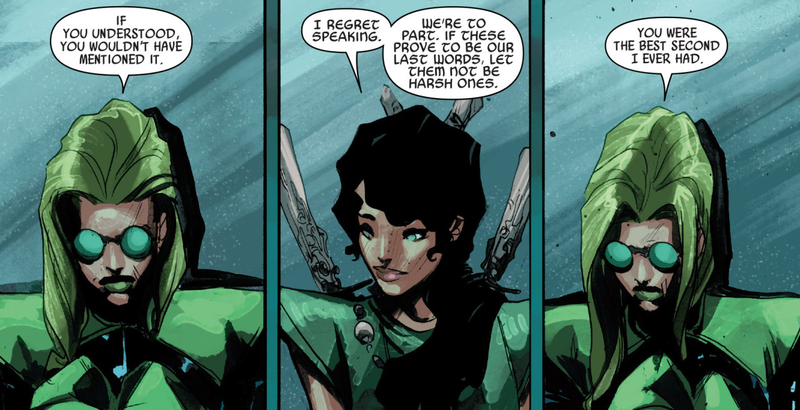 Secret Wars has been going on for over 2 months now, and the more we learn about Doom’s Battleworld, the more twisted it seems. One of the most particular aspects of this world, that has come up in different books time and time again, is The Shield (or The Wall, probably depending on whether the writer watched too much Game of Thrones or not), where anyone who doesn’t obey Doom’s law is sent to fight the rest of their lives against hordes of monsters and zombies. Finally, with this book, we get a closer look at the world behind The Wall. Yay! Even though Siege has been mostly talked about as an ensemble book, it is clear from this issue we have a protagonist: Commander Abigail Brand. So far, I find myself liking Abigail and I do believe it’s mostly thanks to Gillen’s especial talent when it comes to writing blunt-yet-lovable characters (anyone who’s read JIM or WicDiv knows what I’m talking about). She has a small group of characters and pre-established relationships around her that include General Summers, Leah of Hel, and Leonardo Da Vinci, who perfectly play off her at-times-harsh personality. Other than that, not much happens in this first book until the very end, which makes sense considering this is barely issue #1 and we had a lot of characters to introduce. 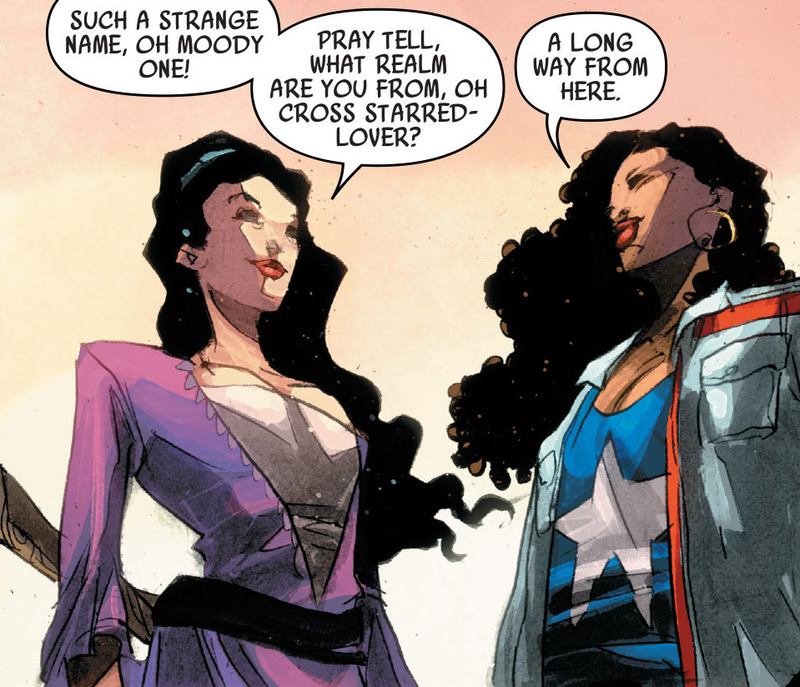 As someone who was excited about having America Chavez and Lady Kate together in a book, I really wish we’d had time for more than one page of them. We can already feel good chemistry building up between them and this particular Kate almost seems like a more likely romantic interest for America than 616’s. That being said, every single page in this book seems to be establishing something important about the world our characters live in and their past. Which is extremely important when the creative team has only 4 issues to tell us this story. I especially enjoyed Hank Pym’s mention and found the Giant Ant-Men story to be blood-chilling. The story about The Shield’s first fall, on the other hand, felt sort of flat to me. Maybe it is because I know this world hasn’t actually existed for 30 years and therefore it’s probably history manufactured by Doom to keep control over The Shield. Nonetheless, it does give us a look into Abigail’s motivations. The ending, which I won’t spoil, is what will set the story into action. Its urgent tone hopefully will be reflected in picking up the pace the next few issues and introducing threats that feel more real. The art is rather different from any other book right now. Its boldness and sharp edges add to The Shield’s hard environment and work perfectly for the action and fight scenes. However, the best part in my honest opinion were the slower moments, like Leah and Abigail’s. Andrade and Gillen really sell the quiet intimate moment after the fast-paced hell we’d seen a few pages before, and those emotional notes are what really make me excited for what’s next in this story. 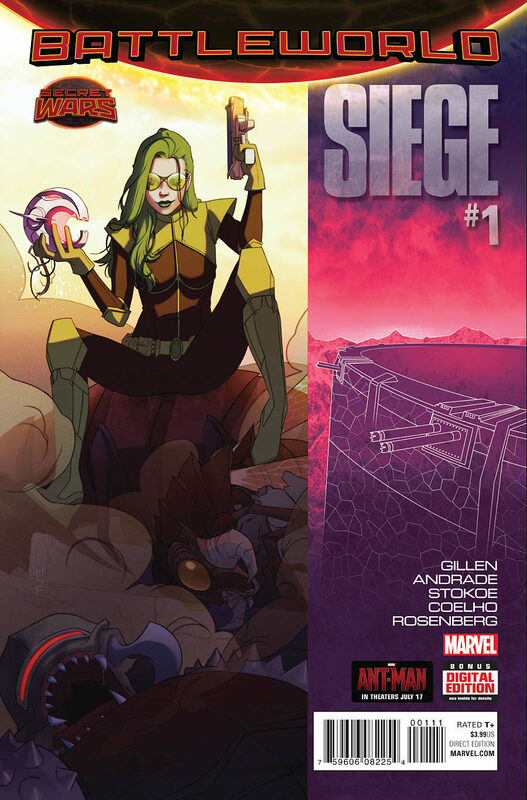 Siege #1 is an exposition book that sets the story into motion, but it’s nonetheless a fun read. Gillen gives us, finally, a deeper look into the world behind The Shield and sets up a cliffhanger that promises loads of action to come. Now that we’ve finally put the beginning aside, I’m hyped to see where Siege takes us. I’m sure it’s going to be a wild ride.